The event wants to include a Q & A section from the audience and wants to open the floor to those who want to pitch their own sustainable products / services. 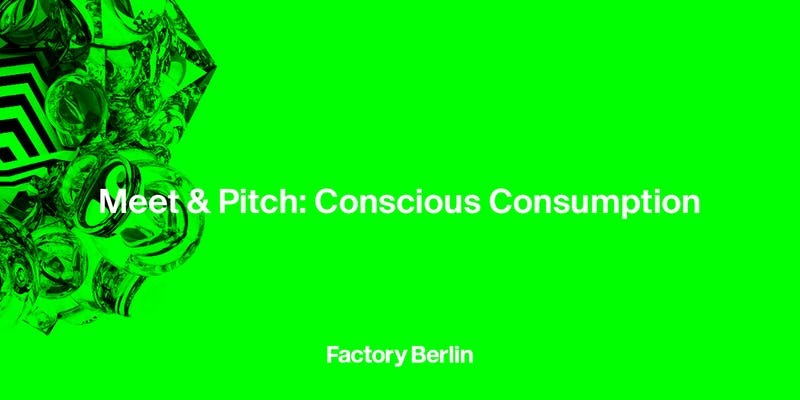 Join us to hear how startups and projects in the Factory Berlin ecosystem are working to reduce the impact our consumption has on the environment. "Food is a new plant-based innovation from Sweden, now taking Berlin by storm. " We have developed these ready-made foods with rich, filling ingredients and colorful flavors to make a bigger impact. " "SUSTAINABLE FASHION MATTERS is the gateway to a world where a conscious lifestyle meets the pressing issues and solutions for today's fashion industry." Join a game changing community, learn how to make the most of the conversational game by learning essential fashion facts. Plan A is the first data-driven action platform in the fight against climate change. "We are using data to predict and make climate change to the hardest and most of the insights, channel capital from planet-aware work to environmental organizations and innovators." For Meet & Pitch events we invite startups from the Berlin Factory network to pitch their products to fellow community members and professionals from the Berlin startup ecosystem. As part of Factory Berlin events, video, picture or audio recordings are made regularly. The attendee / guest agrees that the Factory Berlin or the authorized third parties can create image and / or audio recordings of the attendee / guest during the event at any time and the attendee / guest agrees to.image and/or audio recordings of the attendee/guest during the events at any time and the attendee/guest agrees to such by visiting the respective event. The attendee / guest consents irrevocably, indefinitely and for any current and future audiovisual media in the free use, exploitation and distribution of image and / or audio of his / her person. This includes, but is not limited to, photographs, live broadcasts, broadcasts and / or recordings made by the Factory Berlin.